YMCA’s Sean Harewood launching a counterattack against the Hikers. 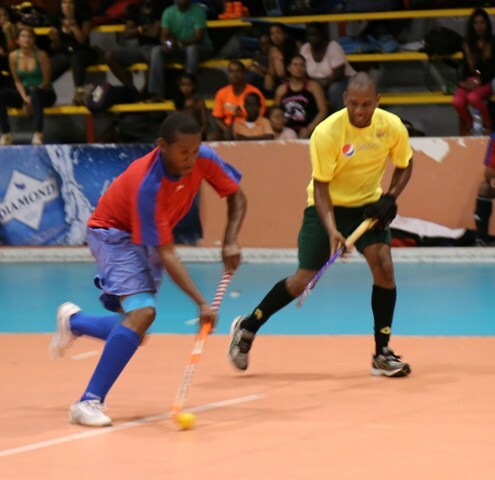 [www.inewsguyana.com] – The second night of the Diamond Mineral Water International Indoor Hockey Festival saw its first taste of international flare as the YMCA men from Barbados, Fatima of Trinidad and the Trinidad Police Force all made their debuts for 2013. The YMCA produced the surprise performance of the night drawing their men’s division clash with defending champions Hikers, 6-6 after blowing a 5-1 half time lead. 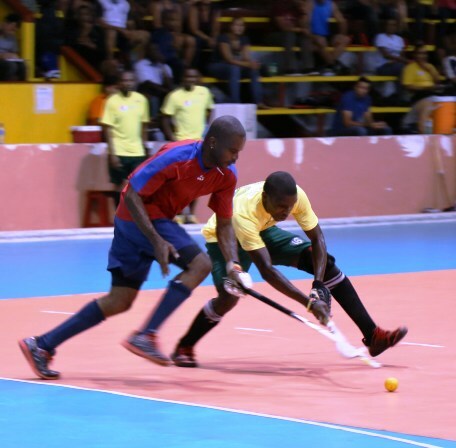 Barbados superstar Rohan ‘Teno’ Thomas was off the mark in the second minute of the match using his blistering pace to overlap up the right side and slam his shot home for YMCA. Thomas would add a second two minutes later and although Hikers striker Robert France pulled his team back within one in the seventh minute, Thomas completed his hatrick five minutes later to give YMCA a 3-1 lead. The Hikers produced moments of brilliance but outstanding goalkeeping from Azad DeAbreu for the YMCA kept them scoreless for the rest of the half. YMCA would put the game seemingly beyond the Hikers by half time as Sean Harewood and Ryan Cowie drilled in one a piece before the break. The Hikers in typical manner held their nerve in the second half and did not disappoint their voluminous fans. Young Aroydy Branford led the charge with a double strike while Devin Munroe, Jamarj Assanah and Captain France, with his second of the match, each marked their names on the score sheet. Tony Cole managed to score the lone goal for YMCA in the second half leaving the final score at 6 – 6. Teno Thomas of YMCA and Hikers’ Jamarj Assanah challenging for possession. In the other men’s match of the evening, GCC put on a clinical display of hockey by demolishing Old Fort by 7 – 1. Led by an inspiring burst of play by striker Leonard George, which included a delicate reverse stick deflection, the Bourda Boys took control from the outset. The GCC vets looked unstoppable as they chalked up their second easy victory of the competition with a 6-2 defeat of Trinidad’s Fatima. The tireless Alan Fernandes proved too much for the Fatima defence as the midfielder tallied a helmet trick (4 goals) for the match, which was accompanied by singles from Philip Fernandes and Damon Woodroffe. Nicholas Wren put in a spirited performance for Fatima but his two goals fell shy of the requirement leaving GCC the runaway victors at 6-2. The Trinidad Police suffered some flight complications and paid a heavy price for having to field a diminished side against the Hickers in the other Caribe vets division clash. The Hickers ended with a resounding 13-0 victory, with a five goal haul from striker George Melville, a hatrick from Amanda Garnett, a double from Devin Munroe and singles from Robert Fernandes, James Mentore and Brian Asregado. Matches continue at the National Gymnasium until Sunday evening, December 1st, with the three finals beginning at 17:00hrs. Admission is free to all games. Previous articleBraithwaite Carts off GNRA handgun Championship.